Wait a minute... What do you mean you're still using them? The success of the above techniques relies on a single common denominator: hitting the right person at the right time. And by that, we don't mean landing them with a right hook (that's not marketing – assault possibly, but not marketing). 'Old style' outbound marketing is a very hit-and-miss affair, with the misses far outweighing the hits. What's more, it's becoming a thing of the past, with Inbound Marketing set to tip these creaky old disciplines from their pedestal. Of course, the marketing agencies still stuck in this archaic groove won't tell you that. The next time one of these has-beens tries to convince you that they can maximise your leads and increase sales through a tired outbound marketing campaign, tell them where to go. They're wrong! 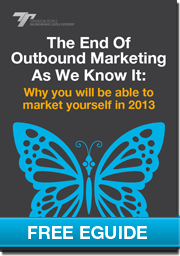 Learn why Inbound Marketing is ushering in a new age of do it yourself promotion with our free eGuide, 'The End of Outbound Marketing as We Know It: Why You Will Be Able to Market Yourself in 2013'.